hi. hello. happy friday. i’m sitting in the restaurant in new york finishing up some work before we all get on a plane and head back to los angeles. i’m pretty worn out after a crazy few days working on that procter & gamble job (you can read about it ) but i feel a huge feeling of relief that the job got done and actually ran pretty smoothly considering there were 1 million little details that needed to happen. so grateful for that. 1. rented in brooklyn so we could all hang together. 2. for the best dinner, just a short walk away. 3. for oyster happy hour. they also have delicious and unique cocktails! 5. for chicken biscuits with hot sauce and honey. the best! 6. , a cute lunch spot. 7. for the coziest dinner of them all in the basement. low ceilings and candles everywhere. go upstairs to for flamenco dancers! 8. for the BEST lobster rolls. You’re coming back to rain – it’s actually THUNDERSTORMING here, believe it or not. Glad it was a successful week! Great iPhone case. Where did you get it? Oh my goodness, this floral backdrop is amazing! You have such a sharp eye! Loving the colorful floral arrangement. My husband is always jetting up to New York for work. Next time I go with him, I’m going to hit up that Pies N Thighs place like there’s no tomorrow. Always down for some good chicken biscuits with honey!! Absolutely GORGEOUS!!!!! I am always so inspired by your talent. That sounds like such a fun trip! I’ll have to check out the places you mentioned when I go to New York. Hey Bri! This looks so great and glad to see you had a great time in New York. But the company that you worked for is called Procter & Gamble! WOWWWWWW! this pic is amazing! pink and more pink! love it! <3 have a nice weekend Bre! 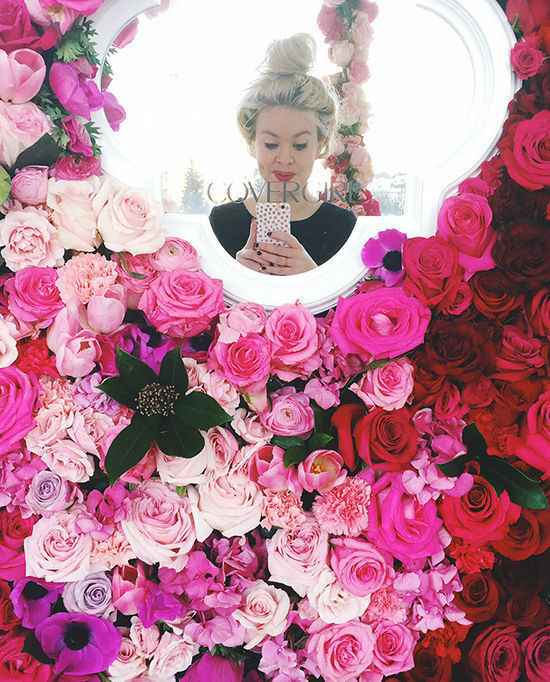 That Cover Girl flower booth is beyond amazing…so beautiful. I bet people just loved taking photos there!